220 volt, 6 batteries charged by: engine, shore power, generator GE KOHLER 115 hrs. An all electric boat. Spacious accommodation with three cabins and huge outside spaces including a swim platform as long as a pier!! ACM sports cruiser for sale in France near the Mediterranean coast with possibility to transfer the very economical inland marina mooring. 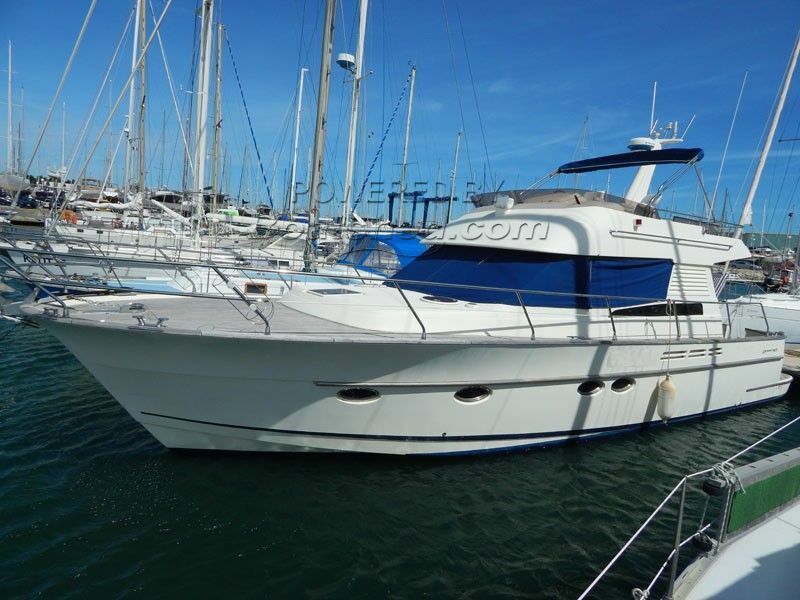 Boatshed Midi Canals is pleased to offer this ACM Dynasty 43 for sale. A great Med. boat with huge deck spaces. Three double cabins and spacious saloon. Reversible air-conditioning for all season comfort. For more information and appointments to visit, please contact Graham WHARMBY your Boatshed Broker at Boatshed Midi Canals. This ACM Dynasty 43 Fly Bridge Sports Cruiser has been personally photographed and viewed by Graham WHARMBY of Boatshed Midi Canals. Click here for contact details.